San Sebastian Harbor condominiums in St. Augustine, Florida. San Sebastian Harbor is a new condominium community to be built on a 13 acre lot located at the gateway to historic downtown St. Augustine. This one-of-a-kind community keeps with the historic Spanish Colonial flavor found in Florida's oldest city. San Sebastian Harbor will offer 96 luxury condominiums, 85 hotel rooms, 24,000 square-feet of boutique shops, a 65-slip marina and river walk and a 10,000-square-foot spa. 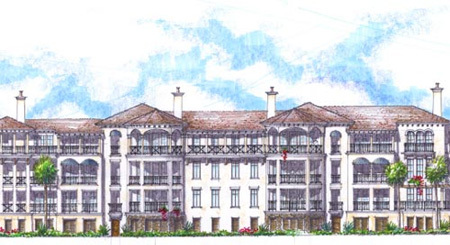 The developer soon will begin the design process for the community and its world-class amenities to include clubhouse, pool, fitness center, and boating facilities. Pre-construction pricing is available from the $650's. Occupancy date in November 2007. A short drive north will find you traversing the rustic cobblestone streets of the downtown historic district. Quaint garden courtyards, ornamental fountains and an eclectic variety of art galleries, restaurants and boutiques line pedestrian-friendly St. George Street. Major cultural landmarks include the Bridge of Lions, Castillo de San Marcos and Fort Matanzas. Just down the road is Guana State Park with it's miles of hiking and biking trails; Ponte Vedra � home of the world-renowned TPC at Sawgrass; and the major metropolitan city of Jacksonville, with it's professional sports franchises, and wide variety of cultural arts venues. West of Villa San Marco you'll find the white-sand shorelines of St. Augustine Beach, Anastasia Island, Vilano Beach and Crescent Beach, which together comprise more than 43 miles of pristine oceanfront. These nearby beaches are perfect for a casual day of beachcombing, swimming, fishing, sailing, biking or simply relaxing in the radiant warmth of the Florida sun. Please contact me if your are interested in having an independent REALTOR® who does not work for the developer represents you. There is no cost to you for my professonal service, and buying directly from the builder does not result in any savings to your purchase price!